I'm hollering at you from under a mountain of boxes. I'm pretty sure I'm in the living room at this point, however if you don't hear from me in a few days, send a rescue team. We're moving. And it's looking like we're going to suffer through the longest move of all time. I'm shuttling some breakables and little things to the new house almost daily. The rest of the time is spent stewing over furniture placement, what should be packed in which box, how to make this the most organized and painless experience possible. Pretty much attempting the impossible. Packing for a family of five is... arduous. As I clean out a drawer, the twins find toys that I had "retired" in the back of cabinets. Little Man screams from the gate- a prisoner surrounded by a plethora of toys and snacks- it's a tough life, for sure. Since the girls have taken to talking until 9:30 at night, yet still waking at the crack of dawn, I am looking forward to containing them in their own individual rooms. This had better cut down on the mischief. In addition, we found a sweet one story house- NO STAIRS! So when the girls forget their glasses on the bureau in their rooms, I don't have to haul my tired behind up a flight of stairs. Valhalla, I tell you. We're going to make it through this huge transition. Right? Maintaining two households, cleaning a new house with more than double the square footage of what we have now, packing and unpacking an endless slew of boxes, fixing up the old house to show like a model, it's all going to be ok. It's not going to kill me... and I'm the Queen of England. 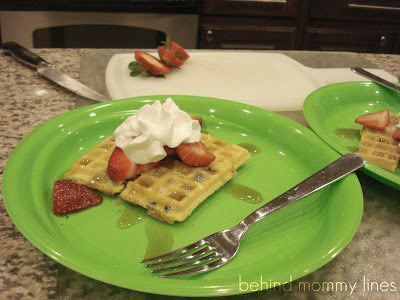 At least today I had all the components for a yummy breakfast- blueberry waffles, sliced strawberries, and whipped cream. Indulgent breakfast makes up for plopping the wee ones in front of back to back movie marathons while I shove their possessions into cardboard boxes. Indeed. Did you sell your house already!? Good luck with your move!! Exciting stuff. Did you sell your house, or just moving to a rental temporarily? By the way, I think I forgot to send my thank yous for the box of clothes you sent. We appreciate it so much!! The girls looked through them with me, and they 'ooohed' and 'aaahhhed' over everything I pulled out. : ) You are so sweet to send them to us!